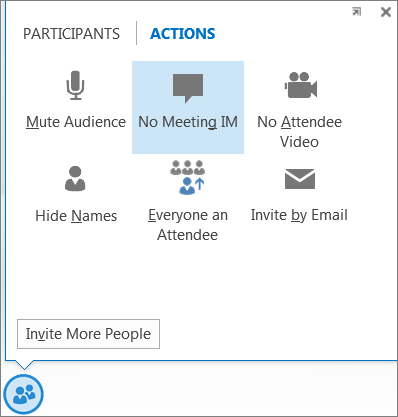 Turning off Lync Meeting IM, lets you keep participants’ focus and attention on the meeting content. You can disable IM when scheduling the meeting, or when you’re in the meeting room. Keep in mind that when you disable IM at the time of scheduling, you can’t turn it back on during the meeting. But if you turn off IM during a meeting, you can turn it back on at any time, to allow shared conversation. On your Outlook ribbon, click New Lync Meeting. Click A new meeting space (I control permissions). At the bottom of the window, click Disable IM. Click OK and set up the rest of your meeting as you normally would. Any of the presenters can turn IM off or on during the meeting, if it hasn’t been disabled at the time of scheduling. Point to the people icon. Lync notifies the meeting participants that the IM has been turned off. To turn the IM back on, go back to the ACTIONS tab, and click Allow Meeting IM.